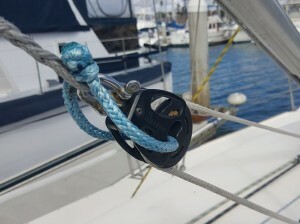 On any raceboat, whether it’s getting a lot of use light abuse, even the most thorough pre-race inspection may fail to reveal potential breakages. So, in the interest of finishing the race and avoiding potentially harmful failures there are simple tricks that’ll give you a piece of mind. Should something break, it won’t be a race-breaker. For example, a broken outhaul can ruin a race. But you can be prepared for this with a few simple ideas. 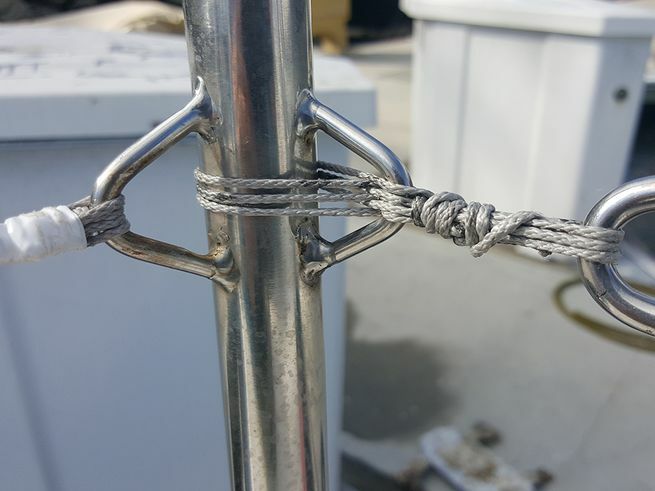 On small boat such as the Melges 24, I install a small ‘V’ cleat at the back of the boom on one side and drill a small hole on the other side. 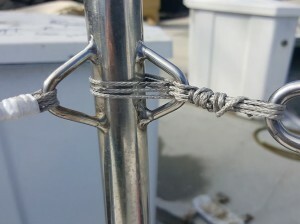 Then a small line with a figure eight knot in the end goes from the hole through the clew and to the cleat. On mid-sized boats, such as 30 footers, I use small lashing set at the maximum ease amount. This way if the outhaul breaks, you can at least finish the race. On larger boats I use the reef line as the outhaul safety. This has the added bonus of being fully adjustable.